In a variety of municipalities and neighbourhoods, notably in Norrland, new social movements has been emergent in recent years. Alienated from traditional ideologies’ they investigate different methods to improve circumstances, to resurrect democracy and to bring power back to the population. Communism died in 1989. In 2008 it was burial time for Social democracy. Don’t mourn. Avoid the swamps of nostalgia. Do not feed the zombies of traditional workers movements’ mainstream still wandering among us. This may for Swedes seem contradictory to our believes: But western Europe’s social democratic parties had – in terms of voter support – their golden age between the mid 1980’s and mid 00’s. The paradigm of neoliberalism that is now eroding was largely introduced and maintained under red flags, to choirs singing »The Internationale« and with slogans of equality. Since the middle of the first decade of the new millennia (and certainly since crisis hit in 2008) we’re observing these parties transition from state bearing positions to, sometimes fast and other times successively, the fringes of the political landscape (See: Rose Thou Art Sick, 2016-02-02). Because of this the 2011 moment, also beyond Europe, lacked most characteristic features of the traditional workers’ movement. Some questions seemed inherently carried in the foundations of insurrections: How do we build counter power against the constituted without soon becoming the same we set out to get rid of? How do we communicate in a situation when all our most beautiful, important words seem distorted, stripped of substance and effect? How do we create a, or many, »we«, not painted in betrayal, blood, nostalgia and disillusion? Many of the movements born out of 2011 felt necessity to begin at, but also to continuously return to, those kind of questions – trying to shape brick-by-brick trough more careful articulations of subjects in motion, to openly and unprejudiced experiment with different tools and configurations. Out of such processes came, among many other and sometimes incompatible considerations, the contours for what we today might depict as (new) »municipalism«. When such theories are now introduced in Sweden, it seems worth studying some localities in Norrland showing basic features for this kind of design, much like Skåne and Blekinge did for the emergence of a new fascism. In the essay »Skånedemokraterna« (also in this issue of Brand, 2/2016, theme: »The Local«), Mathias Wåg depicts how key to success for Sverigedemokraterna was their ability to absorb and reconstitute latent discontent (and its organizers) into a territorial base for a new fascism. It is notable that this became possible by consciously cutting ties to superficial attributes of historical fascism –its milieu, aesthetics, symbols and language particularities. It’s however no coincidence that the party found its base were it did. Economic historian Lovisa Broström has inherently portrayed the context excellently in a 2013 essay (pdf in Swedish) on why fascism never got rooted in Norrland. According to Broström, fascism in Sweden in early 20th century grew particularly strong in a type of rural settings were, landowner aristocrats had such presence that they could ally with the emergent bourgeoisie to uphold a political hegemony granting them support from other sectors of the population. In Norrland landowner aristocrats were almost non-existent during the same epoch. Instead the workers managed to make hegemony for their cause, subordinating the still popular class of more or less self-sustained farmers. Broström further argues that though material conditions since have gradually changed – political traditions often delays, is inherited by later generations. Over time local, regional or national narratives tends to take shape around believed decisive events (or individuals and their legacy) against which contemporary real experience is comprehended. Studying local protest movements and »discontent political parties« in Skåne and correspondingly in Norrland during recent decades these kind of disparities are obvious. Discontent in and close-by Skåne has primarily been expressed as opposition to (high) taxation and against immigration, while in Norrland mainly on resisting depopulation, demanding policies for wealth distribution and protesting the dismantlement of basic public services. An example from Norrland is seen in how Kirunapartiet during the 1990’s and early 2000’s had huge local successes by claiming that the party would maintain (what they called) traditional social democratic ideals. Discontent is however more commonly, despite the point at issue, organized from the position of being »neither left nor right«, marking previously mentioned alienation from both the traditional right wing but as well from social democracy. Also completely extra-parliamentary uprisings like the recent Dorotea Insurrection, the struggle for the hospital in Sollefteå, the »right to the city«-movements in Umeå and the various protests against the closures of village schools, subsumes to this tendency though the issues might seem typical left wing domains. It is hereby also apparent that Sverigedemokraterna has had huge difficulties to establish in Norrland and thereby subordinating discontent to its cause like they managed to do in and around Skåne. For anyone in Sweden looking to resurrect a left beyond its historically burdened mainstream and its broken ideology it seems to investigate the discussed situation of realpolitik is a rational point of departure. Understanding the success of Sverigedemokraterna, but also looking to experiments from progressive movements in other countries. Much could be learned if more municipalities and regions were mapped to understand how locals depict the contemporary trough layers of history and small-scale hegemonies. In such mappings one might find unexpected small print details, which might attach to a common tendency. Seeds for municipalism in Sweden are plentiful, though fragmentally hidden throughout the geography. If one is interested to enhance such assemblages the task is to identify the parts and then begin to put them together, strengthen their viability. In the pamphlet »Declaration« (2012) authors Antonio Negri and Michael Hardt opens by declaring that they have not attempted to write any kind of manifesto. The task, they emphasize, is not to encourage action but rather to identify the subjects already in motion, in relation to what they are subject, and how their inherent constituent abilities could be nurtured to constitute global scale alternatives. Taking that vantage point could lead in various directions but is here used to highlight the above examined. How might we describe the conditions that social movements and protest voting in Norrland is acting against? Which proceeding objectives are these subjects reflecting? It seems obvious it’s not the experience of having ones labour power exploited in a traditional Marxian sense that is at core. Rather its something related to notions popularized by Marxist geographer David Harvey – »Uneven geographical development« and »Accumulation by dispossession«. These frameworks implicates that some at sight very separated discontents actually has strong connections. On the one hand struggles in places plagued by depopulation against (state-driven) disassembling but also against extraction of natural resources. On the other movements in the growing urban districts – most notably in the city of Umeå – against the uneven effects of investments and particularly against how it leads to displacement trough the privatization of space, rising housing prices and rents so on so further. The subject in both, on the surface much different contexts, might be depicted as »the dispossessed«, »the looted«, »the forgotten« or the like. Such subjects are of course present far beyond Norrland, but it is seemingly in that geographical context is has had most fertile grounds to develop, though there are local and neighbourhood exceptions elsewhere in Sweden – notable for example in metropolitan suburbs like Alby, Stockholm and Biskopsgården, Gothenburg. What stands out when one looks at the movements in Norrland is their palpable stronger local anchoring. The Dorotea Insurrection did not only occupy a health centre threatened by cuts for many years, but also forced the first referendum in a whole county council and managed to oust the ruling social democrats from power in exchange for local discontent party Dorotea Kommunlista (DKL). The movements opposing the cuts at the hospital in Sollefteå mobilized incomparable 10 – 15 000 citizens onto the streets of Kramfors during the social democrats regional congress in the autumn 2015. And »right to the city«-movements in Umeå has managed to make their agenda hegemonic in the local sphere. The vantage point in a locally cultivated indignation however simultaneously carries an apparent limitation to the ability for these movements to interconnect beyond their localities. Animosity towards ideas of becoming subsumed to conventional left- or right wing identities (with defined symbols, narratives and so on and so on) has neither yet merged into an alternative like it did in the form of Sverigedemokraterna for simultaneous discontent in and around Skåne. It should be said it’s not at all given that this process, like in the case of Sverigedemokraterna, should move in direction towards designing a standard-structured but populist parliamentary party with a national agenda. That should rather be left open while humbly and pragmatically researching to answer a series of questions: Which tools are best fitted to assembly today’s fragmented discontent? How could the democratic impulses of these kind of very local movements become intensified rather than constrained? How do we negotiate communality between multiplicities of conditions in a situation were many are alienated from traditional ideologies? And how do we really embrace constitutive elements inherent in movements instead of eroding them in the process of interlinking? Right here it seems that the experiences being done and the knowledge produced around tendency of new municipalism in Europe and globally could inspire, or even attach to. 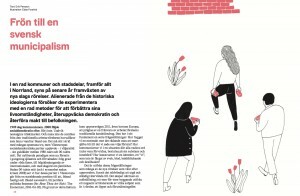 This essay was originally published in Swedish by anarchist periodical Tidningen Brand as part of their nr 2/2016 themed »The local« , focused on introducing theories and experiences of new municipalism to a Swedish speaking milieu. Other articles discussed the attempts with local »right to the city« -lists in Poland, the situation for the take over of city council in Madrid, Spain, the theories of Murray Bookchin and its influence on the harsh-conditioned experiments in the Democratic Federation of Northern Syria, or Rojava, as it was then mostly called, among other things. »Norrland« is in Sweden the common term for the north of the country and though there are for some purposes defined borders it is better understood as a notion of a geographical and cultural context than a mapped space. Skåne is the southern-most landscape and administrative region in the country – Malmö being its largest city. Sverigedemokraterna, translated »The Sweden Democrats«, was born out of the 1980’s neo nazi milieu partially by individuals who had direct links back to the german SS. The party has however during the 21st century moved rapidly towards the programme and character of more moderate right wing populist parties in the other Scandinavian countries.